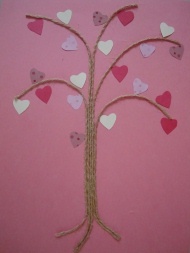 This Love Tree is an adorable Valentine Craft that can be made in many variations. Make it big or small, leave as is, or add special words to each heart-shaped leaf. A great craft for any age! 1. Cut five lengths of your twine (or more if you want more branches). Glue them in a row onto a piece of construction paper. We left some little 'tails' at the bottom to make roots for our tree. Glue them as long as you'd like your tree trunk. 2. To make your first branch split off one piece of twine from the trunk and glue in place. 3. Keep gluing the remaining pieces of twine up straight, splitting off pieces as you work your way up the tree. Split one from the right, then the left, then the right and so on. 4. Cut out hearts from construction paper and glue onto your tree. There are so many possible variations for this craft. You can make your tree small and make a beautiful homemade valentine. Larger trees may be easier for Preschoolers and kindergartners, who may also may need to make their trunks and branches with brown construction paper. If you're giving your Love Tree as a Valentine you can write words on each heart leaf that describe why you love your Valentine. Or, children can write the names of the people they love on each leaf. Be creative!